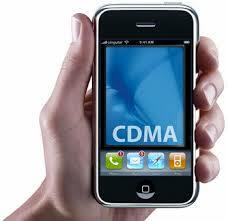 CDMA (Code Division Multiple Access) - a communication format, which stands for code division multiple access. It means, that CDMA communications can be carried out simultaneously in several channels, each of which will have its encoding. ie. Channels are separated by a time code and. To make it easier to present it, give a simple example. there is a device, transmitting a signal (transmitter) and device, receiving a signal (receiver). On the transmitter side there 3 man, which at the same time speak three different languages. At the receiver side is also 3 man, which can simultaneously listen to speakers. Each will only hear the message in their own language, and will not hear others. This is the code division. Higher quality of the connection due to the smaller amount of interference. by the way, for CDMA network use need a special phone, adapted to this network. In other networks, (eg, GSM) it will not work.